I have resigned myself to quietly accept the election results. I will quietly watch the next four years. I will quietly watch as our leaders tell us on a regular basis that the sky is falling. 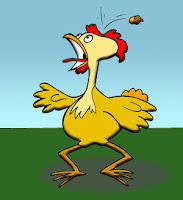 Chicken Little has spoken many times and will continue to scare us with the sky is falling routine. "Oh no its the Fiscal Cliff, we are sure to dive into recession if nothing is compromised"
"Oh no its the Debt Ceiling, we will surely dive into recession if it is not raised." I will quietly watch your 'wagging the dog' saga, knowing that each time it occurs you have some master plan to bring higher taxes and more regulation to Americans. You have the liberal media at your beck and call. Even movies have begun to preach the liberal message. I have quietly quit watching the tube. Mr. Little, perhaps we will survive one more time. Perhaps you will stop the blame game and actually lead this country. I have quietly accepted the fact that I have no control over the sky and whether it is falling or not. You will not hear me complain about any of the future issues that present themselves to us over the next four years. I will quietly remind myself that you will continue to lead us down this path. I will quietly follow. I quietly follow because I know that given enough rope you will eventually hang yourself. It happens all the time, it has happened to many Chickens. So when you cry that the sky is falling again, I will quietly listen and watch but not react. I will simply and quietly go about my business. I quietly know that over the long term, the sky does not fall, the world will continue to turn and that eventually we will 'have change' that matters. I quietly await that day.